Lenovo, officially announces it’s first Chrome OS based netbook ,”ThinkPad X131e” targeting education market of India. Lenovo X131 e Chromebook is specially designed for students studying in the school. By introducing this device Lenovo has become the latest computer manufacturer to partner with Google to develop Chromebooks. Dealing with the Display facts, Lenovo X131e will sports with 11.6-inch screen and it will be powered up with an Intel processor. This Chromebook will give 1366×768 screen resolutions, equipped with HD LED anti-glare screen to protect the screen from scratches and dents and it also dubbed with three USB ports. Students can easily carry the laptop between classes without the need to recharge as the company claims,” The battery life of the device is to be around 6.5 hours, sufficient for an entire school day. That configuration is different from the Windows-powered machine, which uses AMD processors instead. Lenovo joins Samsung and Acer on the Google OS front, suggesting the Google-powered operating system may be starting to gain traction with manufacturers and customers. 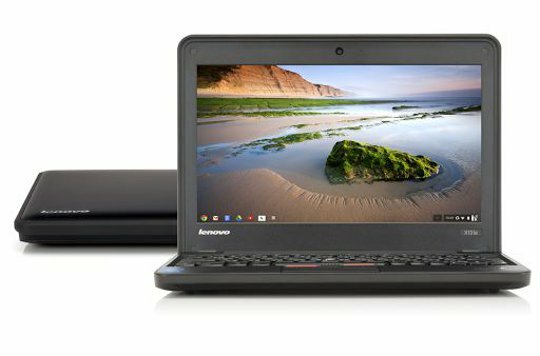 The tough ThinkPad X131e Chromebook is built to be handled by teachers, administrators, and students from kindergarten to high school seniors. Lenovo helped “school-proof” the laptops by adding a rubber bumper around the top cover, as well as stronger corners to protect from accidental drops. The company also claims to have strengthened the hinges so they last more than 50,000 open and close cycles. Caesar Sengupta, Google’s director of Chrome OS product management, said in a press release that Chromebooks are already used in more than a thousand K-12 schools. Lenovo’s foray into Chromebooks will only add to that number. Although we don’t know exact pricing on these yet*, we do know that Google had offered its Samsung Series 5 Chromebook to schools for $100 back in December, discounted from its list price of $430. It is reported, the ThinkPad X131e will be available starting February 26 under special bid for school systems. Lenovo X131e might come with an Atom CPU and includes customization options like colors, asset tagging, and school logo etching. Typical laptops have many potential points of entry for dust, water and other environmental pollutants, Rugged laptops, however, are fully sealed against the environment.